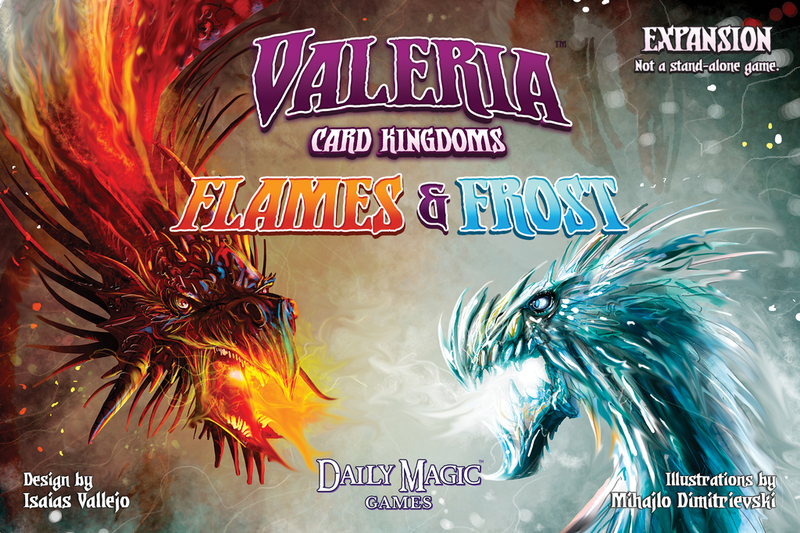 Valeria: Card Kingdoms – Flames & Frost is an expansion for Valeria: Card Kingdoms by Isaias Vallejo, published by Daily Magic Games. It is for 1-5 players. This expansion adds a whole bunch of brand new cards as well as some extra tokens. The setup for this expansion follows the basic setup rules in the base game rulebook. However, there are a few differences that should be noted. With this expansion, 1 Exhausted card and 1 Event card per player are shuffled together and then placed in a stack above the Monster row. The remaining Exhausted and Event cards are returned to the box. It should also be noted that during the Action phase, when an Event is revealed, the players must follow the instructions on the card before moving to the the next action or phase. Actions taken as a result of the Event card will not count as a player’s action for the turn. Other than these few instances, the rules remain unchanged. So just what does this expansion add as far as new content? Well as previously mentioned, there are lots of new cards including Event cards. These Event cards will add a new dynamic to the game which can be either helpful or harmful, depending on the Event. There are also lots of new Citizens, Monsters, Dukes and Domains. New Citizen cards like the Bard, Baker and Summoner. New Monster cards that are Flame and Frost themed like the Lava Hound, Efreet, Yeti and Snow Queen. New Dukes like Shem the North Sea Guardian and High Priestess Marianna. New Domains that are also themed like Wandering Flame, Den of the Ice Witch, Flame Tongue Fountain and Switch Wind Fortress. On these cards are several new icons like the Wild icon which represents all of the other resources and can be used as any of those resources. There are also icons that explain things a bit differently. Such as banish card, cannot take, opponents and you. Each of these icons replace text with a symbol to instruct players how to perform an action. Another new aspect is that there are now 5 new Monster areas that can be interchanged into the stacks. There’s the Desert, Glacier, Oasis, Tundra and Volcano. As you can see these are appropriately themed. This expansion introduces lots of new cards which I described earlier in the overview. Each new card looks stunning. I’m simply amazed at the look of each one and I love the new artwork. Of course these cards are all thematic and fit in with either the Flame or Frost design. There are also new player aid cards which are fantastic and a great help. One side covers the basics of gameplay including the different phases, as well as the game end scenario, while the flip side covers all the icons on the cards. The expansion also has new card dividers much like those in the base game. These help divide your cards when placing them together into the base game box. One last thing that comes in the box is a set of 9 more multiplier tokens. These are thick cardboard just like those with the base game. Overall, I love the artwork and think that the new themes come through really well in this expansion. For me, it is truly beautiful. The rulebook for this expansion is a single double sided sheet of paper. While the sheet is full color and glossy it doesn’t have any real pictures or examples to speak of. One side covers the story behind the expansion and details the new rule changes. The opposite side covers the new icons and includes a card clarification for Betrayal of Bonds. As you can see, there’s not a whole lot to this, however it’s not like there’s much that changed. As it is, there was not really any need for a big thick rulebook when there were only minor changes to the base game rules. Plus this expansion is only usuable if you have a copy of the base game so you should already have everything you need in that box. Overall, this gets the job done. What is there to say about this expansion that hasn’t already been said about the base game? Basically this expansion adds a lot more stuff to an already amazing game. It adds the new themes of Flames and Frost which are found in each of the card types. I like the addition of the new wild resources which makes things a little easier to pay costs or to get the resource that you need. The Events shake things up a bit and add some new twists during the game. Just like the original game, this new iconography is a bit challenging to remember for the first couple of games. However, it’s not that bad. I will say that if you already enjoy the base game, this will simply add to that enjoyment. As I’ve mentioned in the review of the base game, fans of Machi Koro will enjoy this. I highly recommend this expansion. For me, this is a must own expansion. The added excitement and variety gives me plenty of new stuff to add to the replayability of the base game. I can’t say much more than that. 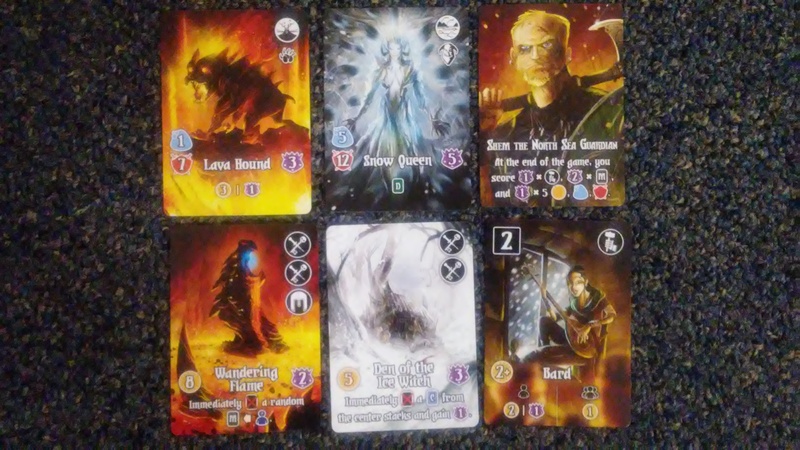 Valeria: Card Kingdoms – Flames & Frost is an expansion for Valeria: Card Kingdoms that adds lots of new cards to an already great game. There’s plenty of new elements included with the game which are very much in line with the Flames and Frost themes. There’s not really any adjustments to play time. Most game sessions are still around the 30-40 minute time frame. The artwork on the new cards is absolutely stunning. Each one fits in with the new themes. Fans of the original game will be extremely happy to add this to their base game as it adds lots more replayability and some new mechanics like the wild resource and Events. Fans of the original will most definitely want to pick up a copy of this. For me it’s a must buy. I highly recommend this expansion. It’s a hot expansion that’s cool to play. This entry was posted in Reviews and tagged board, board games, card, card games, card kingdoms, daily, daily magic games, flames, flames & frost, flames and frost, frost, games, isaias, Isaias Vallejo, kingdoms, magic, valeria, valeria card kingdoms, vallejo. Bookmark the permalink.